MERRILL – The Marshfield wrestling team is heading back to team sectionals for the third year in a row after capturing first place at the WIAA Division 1 regional on Saturday at Merrill High School. The Tigers finished with seven individual champions and had 237 points to outlast Wisconsin Rapids, which finished second with 204.5 points. Rapids had beaten Marshfield at last week’s Wisconsin Valley Conference Tournament by 5½ points. Marshfield will take on River Falls at the team sectional Tuesday night at Wausau East with a berth to the WIAA State Team Wrestling Tournament on the line. The Tigers reached the state tournament last year for the first time since 2003. Marshfield will send 10 wrestlers to the WIAA Division 1 individual sectional Feb. 16 at Menomonie. 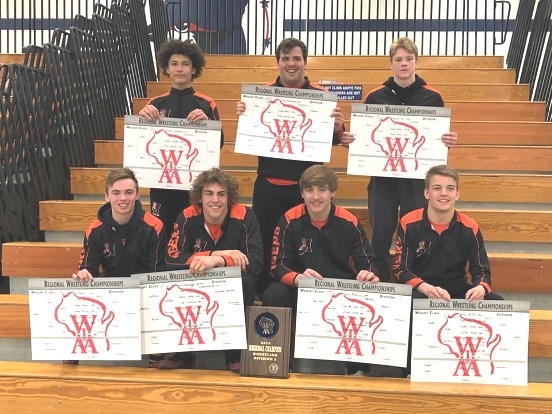 The top two finishers in each weight class will qualify for the 2019 WIAA State Individual Wrestling Tournament at the Kohl Center in Madison on Feb. 21-23. All five of the Tigers who reached the individual state tournament last season won regional titles on Saturday. Sophomore Gabe Pugh (32-4) won at 126 pounds, senior Tanner Kanable (34-6) finished first at 138, senior Nolan Hertel (37-1) won the 152-pound title, senior Bentley Schwanebeck-Ostermann (38-1) was first at 182, and Sam Mitchell (38-1) won the 195-pound championship match by technical fall. Marshfield’s other regional titles came from freshman Ryan Dolezal (24-7) at 132 pounds and senior Sam Haessly (13-3) at 285. Keagen Cliver (26-10) was second at 113 pounds, Shane Westerhausen (23-11) finished second at 120 after winning a third-place match and a second-place wrestleback, and Caden Pearce (35-6) took second at 145 pounds to grab the Tigers’ other three sectional qualifying spots. Team scores: 1. Marshfield 237; 2. Wisconsin Rapids 204.5; 3. Stevens Point 158; 4. D.C. Everest 153; 5. Rhinelander 118; 6. Wausau West 117.5; 7. Merrill 106; 8. Wausau East 0. Championship: Justin Groshek (SP) won major dec. over Preston Spray (WR), 12-4. Third place: Tim Fox (RH) won major dec. over Rachel Trevino (WW), 9-0. Championship: Karter Stuttgen (SP) won major dec. over Keagan Cliver (MAR), 10-0. Third place: Jacob Pease (WW) def. Hugh Weise (RH), 7-5. Championship: Corbin Trotzer (DC) pinned Tanner Depies (MER), 0:49. Third place: Shane Westerhausen (MAR) def. Damien Bennet (WR), 5-2. Second-place wrestleback: Westerhausen (MAR) pinned Depies (MER), 4:56. Fourth-place wrestleback: Damien Bennet (WR) def. Yang (WW), 6-3. Championship: Gabe Pugh (MAR) def. Cameron Schmeiser (WW), 11-5. Third place: Cale Benitz (WR) def. Joe Pecore (SP), 7-2. Second-place wrestleback: Benitz (WR) def. Schmeiser (WW), 6-4, SV. Championship: Ryan Dolezal (MAR) won major dec. over Ryan Sering (WR), 12-4. Third place: Max Schierl (SP) won major dec. over Freddy Lehrke (DC), 12-2. Second-place wrestleback: Schierl (SP) def. Sering (WR), 3-0. Fourth-place wrestleback: Lehrke (DC) def. Gabriel Ramos (WW), 9-2. Championship: Tanner Kanable (MAR) def. Zac Hamel (WR), 3-2. Third place: Demitrio Covarrubias (DC) def. Cooper Behnke (SP), 8-4. Second-place wrestleback: Covarrubias (DC) def. Hamel (WR), 9-4. Championship: Wyler Lubeck (WR) def. Caden Pearce (MAR), 3-1 SV. Third place: Payton Vaughn (DC) pinned Conner Seavers (SP), 2:21. Championship: Nolan Hertel (MAR) won technical fall over Walker Hartman (RH), 20-3. Third place: Gabe Carter (DC) def. Carter Bayer (MER), 7-2. Championship: Carson Trotzer (DC) pinned Sam Molski (SP), 0:24. Third place: Eric Grulke (RH) def. Roger Fuller (WR), 3-2. Championship: Bradley Leiskau (MER) pinned Isaac Diaz (WR), 0:44. Third place: Gavin Ostermann (RH) pinned Brenden Braund (MAR), 3:20. Fourth-place wrestleback: Nick Klug (DC) def. Braund (MAR), 6-0. Championship: Bentley Schwanebeck-Ostermann (MAR) pinned Andrew Schutz (WR), 1:09. Third place: Ben Sinclair (RH) pinned Nathan LaRue (WW), 3:29. Championship: Sam Mitchell (MAR) won technical fall over Peter Rucker (WR), 17-2. Third place: Orion Boe (DC) pinned Connor Lund (RH), 5:13. Championship: Jaren Rohde (SP) def. Layne Kalata (WR), 6-4. Third place: Trevor Knapp (RH) def. Walker Bathke (MER), 7-1. Fourth-place wrestleback: Justin Bonke (WW) pinned Bathke (MER), 0:26. Championship: Sam Haessly (MAR) def. Zach Iribarren (MER), 3-1. Third place: Mike Iverson (WR) pinned Alex Olson (RH), 3:00. Fourth-place wrestleback: David Bell (DC) pinned Olson (RH), 0:40.